Jerusalem is the largest city in Israel. As of 2007, Jerusalem had an estimated population of 732,100. The Temple Mount and Western Wall (for Jews). The Church of the Holy Sepulchre (for Christians) - also known as the Church of the Resurrection - Containing the site of as Golgotha, the Hill of Calvary, where Jesus was crucified, and the location where Jesus was buried (the sepulchre). Today the church is also used as the headquarters for the Catholic Archpriest of the Basilia of the Holy Sepulchre, and the Orthodox Patriarch of Jerusalem. The political status of Jerusalem remains an issue of dispute. The Israeli position is that East Jerusalem (captured in the 1967 Six Day War), is part of the state of Israel, and the whole of Jerusalem is the country's "eternal and indivisible" capital - however most countries do not recognize this claim (United Nations Security Council Resolution 478 explicitly rejected it), and maintain their embassies and other diplomatic missions in Tel Aviv. Meanwhile, the Palestinians also claim sovereignty over East Jerusalem, and hope to locate the capital of a future Palestinian state in East Jerusalem. In 1995, the United States Congress passed the Jerusalem Act, stating that "Jerusalem should be recognized as the capital of the State of Israel; and the United States Embassy in Israel should be established in Jerusalem no later than May 31, 1999". 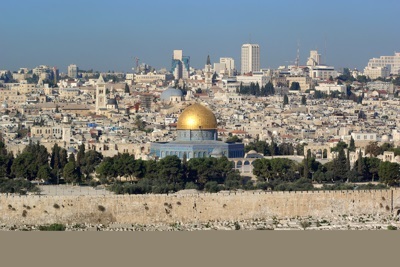 Consequently official US government documents and web sites refer to Jerusalem as the capital of Israel. The US embassy in Israel has not however been moved yet, as to do so requires the agreement of the President. Twins Tours & Travel Ltd. The Via Dolorosa--Latin for "Way of Grief," "Way of Sorrows," or "Painful Way"--is a street in the Old City of Jerusalem, held to be the route that Jesus walked on the way to his crucifixion. It is a distance of about six hundred meters (two thousand feet) but a one-hour walk with prayers and devotions. I know the Via Dolorosa because I grew up on the Via Dolorosa. As a boy, I played on its winding pathway, and for many years I have guided pilgrims retracing the footsteps of Jesus from Pilate's praetorium to Calvary. I know every doorway, every window overhead, every arch and column, the color, texture, and peculiarities of its walls. If every stone in the pavement had a name, I could call out each one individually. The interiors of sites such as the Church of the Holy Sepulcher are as familiar to me as your living room is to you. But this book is so much more than a guided tour of the Via Dolorosa. It is certainly that--it will steer you from one site to the next down the narrow, stony pathway. But it is also a guide to greater depth in your relationship with Jesus, to the wonders of God's Word, to lives lived in the shadow of persecution and the power of the cross, and to your own life. In taking you faithfully through the stations of the cross, it will also transport you far beyond them on an eye-­opening journey through the Bible, set against the background of Middle Eastern culture, customs, and history. Very importantly, I hope this book will help you personalize, to the extent such a thing is possible, what Jesus endured as He bore His cross along the "Way of Sorrow." I want these pages to awaken your imagination, your emotions, and your heart so you will feel something of what Jesus might have felt and seen and thought, and so appreciate all the more the price He paid for you and me on that tragic, glorious day of His crucifixion. I hope this will be your experience as you read. By the request of the many groups I have guided, this book will also share my personal story as a Palestinian Maronite Arab Christian. (For a detailed discussion of the Maronites, see appendix A.) Growing up here in the roily tension zone of three great world religions--Christianity, Judaism, and Islam--I connect intimately with each one of the stations of the cross. As I share with you key passages of my life, I hope you will see in some of them reflections of your own life--for we all, each one of us, are bearing crosses of different sizes, shapes, and weights down our own Via Dolorosas. And the Spirit of Jesus is carrying us along beyond our griefs toward a glory greater than we can imagine. Finally, I hope this book will awaken you to the plight of your brothers and sisters here in Jerusalem and in the Middle East. I desire that you will feel moved . . .
to action, as you discover how you can come alongside your brothers and sisters here in the Middle East--and why it is so important, for both our sake and your own, that you do so.